Aerial view of roads and agricultural land inundated by floods in Banke district, south-western Nepal. Disaster risk is outpacing resilience in Asia-Pacific and putting people in this most disaster-prone region at risk of being pushed back into poverty, the latest report from a United Nations regional commission has revealed. “Disasters can very quickly strip poor people of their livelihoods bringing deeply disruptive impacts that push them back into absolute poverty or trap them in an intergenerational transmission of poverty,” said Shamshad Akhtar, Executive Secretary of the UN Economic and Social Commission for Asia and the Pacific (ESCAP), as she launched the report in Bangkok today. Asia-Pacific Disaster Report 2017 shows that the greatest impacts of disasters are in countries which have the least capacity to prepare or respond to these events. Between 2000 and 2015, the low- and lower middle-income countries in the region experienced almost 15 times more disaster deaths than the region's high-income countries. Beyond the human costs, ESCAP research indicates that between 2015 and 2030, 40 per cent of global economic losses from disasters will be in Asia and the Pacific, while the region accounts for around 36 per cent of global gross domestic product (GDP). The greatest burden of the losses as a proportion of GDP will be borne by small island developing States with average annual losses close to 4 per cent of their GDP while the least developed countries will have annual losses of around 2.5 per cent of GDP. Ms. Akhtar said that action on early warning systems is critical, and called for cost-effective financing that is needed to decrease the existing resilience gaps. “The absence of an institutionalized insurance culture and adequate post disaster financing threaten our extraordinary economic and developmental achievements. Promoting more, and deeper, collaboration among countries in the region on disaster risk financing will be an ESCAP priority,” she added. ESCAP argues that measures for disaster risk reduction should take account of the shifting risks associated with climate change, especially in risk hotspots where a greater likelihood of change coincides with a higher concentration of poor, vulnerable or marginalized people. The report – presented at the opening of the ESCAP Committee on Disaster Risk Reduction during the first ESCAP Disaster Resilience Week – aims to assist policymakers, in both public and private sectors, to better understand disaster risk and take action in the context of the 2030 Agenda on Sustainable Development and the Sendai Framework for Disaster Risk Reduction. 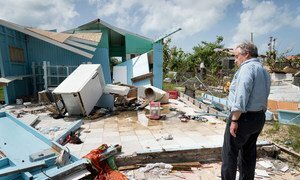 Having seen first-hand the destruction wrought by the recent hurricanes in the Caribbean, United Nations Secretary-General António Guterres on Saturday called for the full mobilization of the international community to support the people of the affected areas, while stressing the need to accelerate climate action.